ROBOTILL Version 2.3 has been released and is available for download. 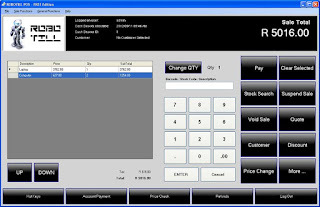 The screen layout of the main POS screen has been changed to be more Touch Screen friendly. Several other changes have been made for touch screen support in other screens as well. The system however still works great with or without a touch screen. The More button can now further be customized to include shortcuts to commonly used stock, POS functions and/or custom functions to interact with other systems. The BULK import function can also now accept Stock On Hand as an optional field. Stock Receiving now allows you to capture the Price including or excluding tax if a price change is applicable. The free edition now allows up to 200 sales per day. Existing customers can upgrade to the new version. All data and settings from the previous installation will be carried over. To see how this easy to use and powerful Point of Sale System works, download the ROBOTILL FREE Edition from the ROBOTILL website.